You may possibly know some of the human-created Rabbit stories here, or the names of ancient Rabbit gods, but chances are not so good. Children's books of the past couple of hundred years contain many fictional Bunny characters, but long ago Rabbits found their way into mythology across the world, owing perhaps to the divinity sensed by humanity in the presence of a Bunny. In some cases the myths appear to be based only on observations of behavior, such as the zig-zag hopping patterns used to evade meat-eaters. In still others, the stories are seeming corruptions of Bunnyness by the confused, envious or unenlightened. Beyond the "luck" aspect of catching a Rabbit for dinner, though, lies the belief of the Magic Rabbit, that somehow the Bunny has a type of power to fend off evil and bring good into one's life. 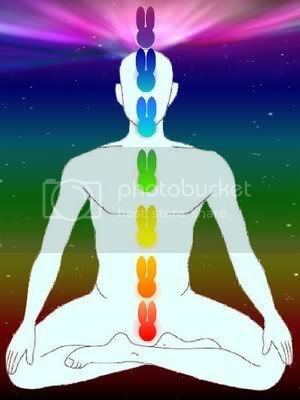 This is more of our modern "lucky foot" concept, thought to stem mostly from mystical African-based hoodoo beliefs. Those who have read our church literature know very well by now, though, why Bunnies are thought to have power! Bunnies were the first creature creation of the Cosmic Bunny and do indeed possess an advanced level of spiritual awareness and energy, which can manifest things in ways we'd consider magical. Humans often have an intuitive sense about this (we do have Inner Bunnies, after all), leading to the association of Bunnies with magical powers. The next set of Bunny tales is a bit more, well, cosmic. Thinking of Rabbits when observing the heavens was the basis for many ancient myths. I believe, however, that the Cosmic Bunny gave us this one small constellation to show that all creatures are represented (even the dog) and that, even though Bunnies are fuzzy and wise, in the end we are all part of the Cosmic Bunny. 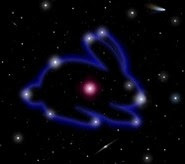 The Lepus constellation is there, but not easy to see, symbolizing the need to look deeply, not quickly or superficially, to find your Inner Bunny and the spiritual path. 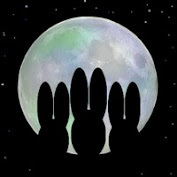 I like Nanabozho and the Japanese Bunny in the Moon story! 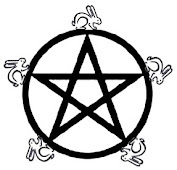 i'm surprised that You left out the Three Hares, a symbol found in numerous religious traditions. 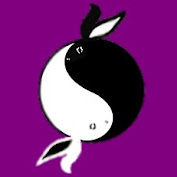 Oh, there is also Wu Tien Bao or Tu Er Shen (兔兒神), a Chinese deity. His name literally means "rabbit deity".